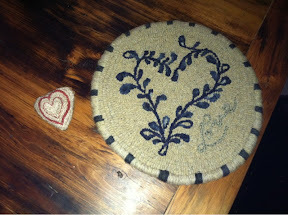 Last week, I ordered these two pieces of folk art from the Primitive Handmade Mercantile site. I've always looked at the offerings but only now was I inspired to order. The hooked chairpad was hooked by Dorrie of Olde Threads. Her hooking is very neat and her finish is perfect!! Very refined compared to my rustic hooking style! I want you to see this little punched heart close up! 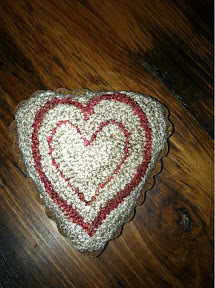 Ronda of Simple Thyme Prims , the stitcher, put it in a tiny vintage heart tin. Lots of work in both ~ my first PHM foray proved to be a happy thing! I love them both! Lots going on here! We are leaving for Florida Friday ~ woo hoo!! Thank goodness for Tad's sitter, Barb ~ I can leave him and know that he'll be well taken care of and happy. In fact ~ he's almost too happy!! Gotta pack, finish up office work, do laundry and on and on!!! Two students in my class tonite ~ we had fun! 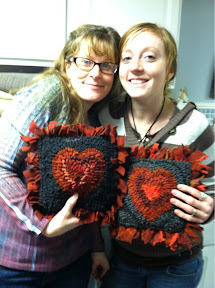 Tonya wanted a Valentine project and her daughter, Sam, came along! We had fun ~ lots of laughs ~ and a nice chili soup for our supper! These girls put the hook to the linen and left with a finished project!! Hooked, sewn together, stuffed, stitched the opening closed and proddied the edge!! Very proud of them and Sam has not hooked before!! Good job, ladies!! 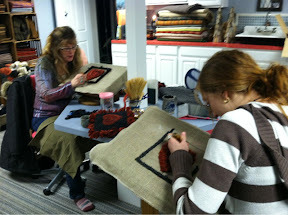 One of my rug hooking friends wants to do a class on hearts in preparation for Valentines Day!! So, on Monday, January 28, we're going to do this heart pillow with the proddy edge or a heart chairpad with hand-torn 1" strips!!! Class will be from 10-4. If you're interested, let me know soon so I can draw you a pattern and plan a little lunch!!!! You can call me at 419-565-8821, email at gfraizer@neo.rr.com or respond here!! Come join us ~ it'll be fun!!! This is what I looked like today! I had my second acupuncture treatment for my back and a hip issue I've had for the last nine months or so. The good news is I'm getting some relief already! I'm excited! I'll keep you posted. A couple of you asked for the appetizer recipe that I talked about the other day, so here goes! Put all ingredients in a crockpot until melted and mix together. Or~ put them all in a casserole in a 350 deg. oven for 30-45 minutes. Mix together when melted. Use Fritos scoops for dipping and it's also good on a toasted English muffin the next morning! Recipe can be cut in half for a smaller amount. Enjoy! On Christmas Eve, we went to Teddy and Miki's for supper and a gathering with family members. My Seattle son and family arrived on Saturday so it was all of us and some of Miki's family along with my kids' step-mom and step-sister and their families. It's a long story but we all get along and like each other, so it was fun! Grandson Luke has been going to church with neighbors and has become quite active in the youth group and confirmation class in preparation to join the Methodist church. I'm quite proud of him and when he asked if we would all go to Christmas Eve services, we were glad to join him. Tad even went along ~ he wasn't going to and that was fine but at the last minute, he changed his mind ~ of course, we were all really glad for him to join us! We took up the whole front row ~ that's where Luke wanted us to sit! Sonny's kids spend Christmas Eve with their mom, so it was us and my three sons and families. When the pastor asked for kids to come up for the children's sermon, some of our grand kids went up along with others. I was telling my son, Chris, that when Tad was little, during church, he went to the downstairs nursery. One Sunday when the minister called for the children's sermon, Tad shot out the door that came from the basement onto the altar! He had 'escaped' and this little bespectacled kid came running across the altar (looking for his mom) but the minister said "Look! They'll come from anywhere to hear me preach"!!! It was funny ~ everybody laughed ~ but me! Well, just as I finished telling this to Chris, Tad got up out of his seat and joined the grandchildren on the steps of the altar to once again hear the children's sermon. It was very sweet ~ Tad just turned 48 and has Down's syndrome and is very capable in many ways ~ but still a child at heart. Sonny and I were married in that church 30 years ago and it was really nice of Luke to encourage his family to go with him. Everyone knows him and you can tell he has a church family there. It was a sweet evening ~ thank you, Luke!! 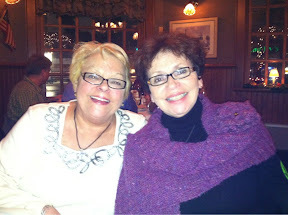 Abundance to me is having lots of friends ~ Janet is one of them! They spent New Year's Eve with us at the lake at 1812 Spirits for a great dinner. Our lake friends, Carol and Bill and Diane and Greg were there, too! We had cocktail hour in the afternoon at D & G's and pork and sauerkraut dinner at our house on New Years Day! A full weekend with friends ~ abundance indeed!! Another friend, Jackie, knitted me this beautiful purple shawl for Christmas!! What a surprise when I received a package from her and an even bigger surprise to have it be something made by her for me! Thank you, Jackie!! Abundance comes in all forms and it doesn't always mean money!! Just going to post tidbits of the holidays here and there. This is Seattle granddaughter, Hannah, and she wanted to bake cookies while home with her grandma. It was the night before they were leaving and it hadn't happened yet. So, at 1 a.m. after everyone left from celebrating Tad's birthday ~ we baked cookies and packed them up for their flight the next day!!! It was fun and she is such a sweet girl. She called a couple of weeks ago while she was baking at home to find out what sifted flour was!!! 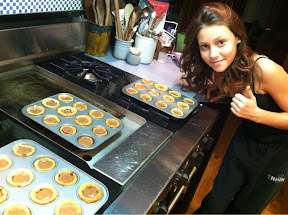 She's 11 and really likes to cook ~ wish she was closer!! She is particularly in tune with Tad ~ so kind and sweet to him! Love you Hannah!! 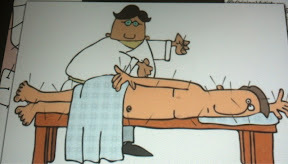 This morning, I had a first-time acupuncture treatment for a back and hip issue. I'm going to have several to see if I can get some relief ~ wish me luck!! Tonite, Sonny's brothers and wives are coming for a get together that we have every January. I made a Pinterest recipe (three package roast beef) for sliders. It is great! Check my FOOOOD board on Pinterest for the recipe ~ really tasty. My SILs all are good cooks and each bring a dish or two. I'm also having an appetizer of velveeta cheese, crab meat and mushrooms that you dip Fritos in ~ it's also yummy!!!! A little fattening, maybe!! So that's it from here ~ hope all is well in your corners of the world!! Although very belated, I wanted to wish you a great new year ~ happy, healthy and prosperous!! I've had a hard time getting back into blogging ~ hopefully, this will be the jump start I need!! I was so sick the week before Christmas and not on top of my game when my Seattle kids arrived. I feel like the week was a blur of cooking, eating, coming and going ~ it's taken me a bit to get back to normal. Hope you are all doing well and flu-free and enjoying the after-holiday quiet! !